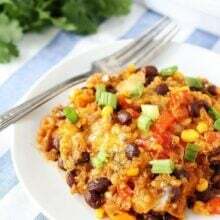 Green Chile Enchilada Quinoa Bake-this gluten-free quinoa bake will remind you of your favorite green chile enchiladas. It is easy to make and a hit with the entire family! Once upon a time, I made this Green Chile Enchilada Quinoa Bake for dinner and and it was pretty much the ugliest meal I’ve ever made. I wasn’t going to share the recipe, but then we ate it and all decided it was one of the tastiest meals I’ve ever made. When I say we, that includes Caleb. Yep, our toddler asked for seconds and ate leftovers the next day. He even asked if we could eat the quinoa bake every night for dinner. In my book, that is a blog worthy recipe…even if the pictures aren’t pretty. So just trust me on this one. 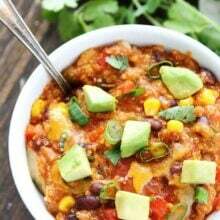 This Green Chile Enchilada Quinoa Bake won’t win any beauty awards, but it will win the most delicious dinner award. I promise, this dish is worth making! 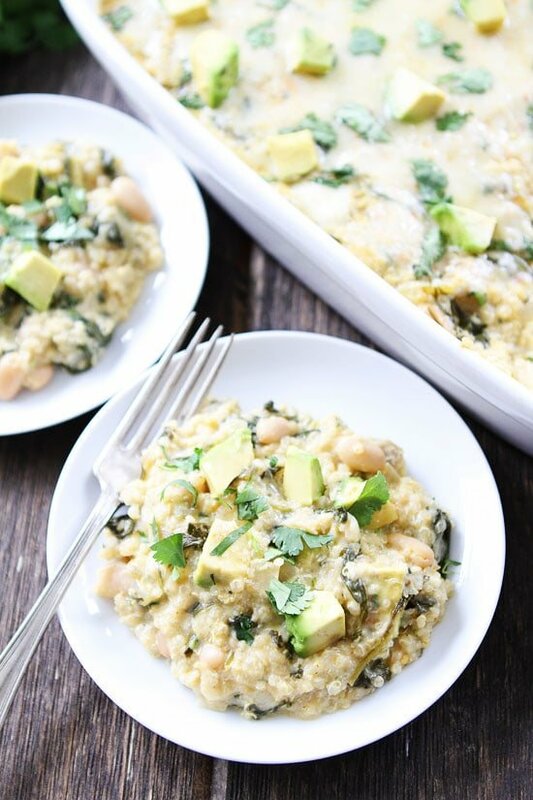 This quinoa bake was inspired by two of my favorite recipes, our Black Bean Quinoa Enchilada Bake and our Creamy Spinach and Green Chile Enchiladas. I basically turned the green chile enchiladas into a quinoa bake. All of the same flavors, but casserole style! Easy peasy, comforting, and so good! 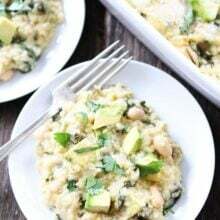 I used white beans in this quinoa bake because I was trying to make the dish match and look good, but obviously that didn’t work:) So if you prefer black beans or pinto beans, use them! Before serving, I top the quinoa bake with avocado and cilantro. It helps perk the dish up a bit and you can never go wrong with avocado! 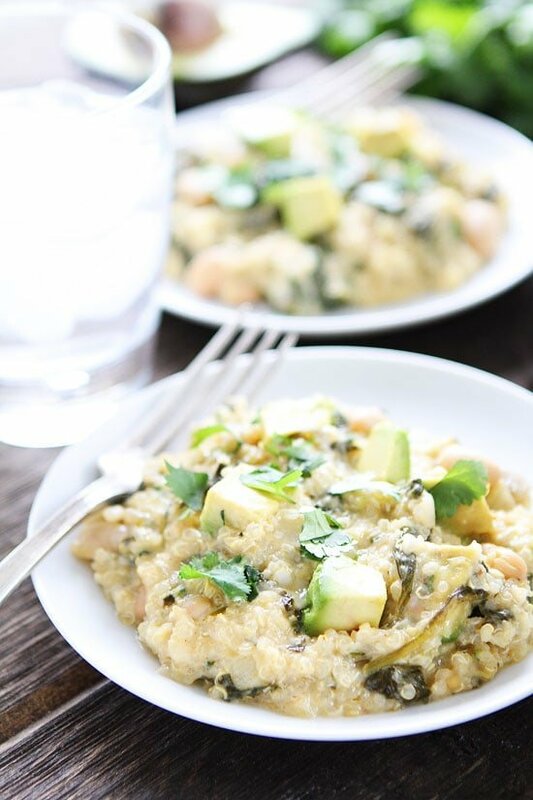 If you are looking for a delicious dinner idea, make this Green Chile Enchilada Quinoa Bake. If you want to eat it blindfolded, I won’t be offended:) I promise it is super tasty! Just trust me on this one! And if you don’t believe me, ask Caleb. He will back me up on this one! 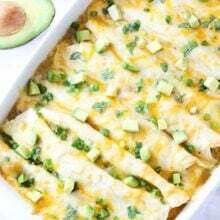 This enchilada bake is a family favorite! Make it for dinner tonight! 1. Preheat the oven to 350 degrees F. Grease a 9x13 baking dish with cooking spray and set aside. 3. In a large skillet, heat the tablespoon of olive oil over medium-high heat. Add the onion and garlic. Sauté until softened, about 5 minutes. Add the spinach and cook for about 5 minutes, our until spinach shrinks down. It will shrink down a lot. Add the lime juice, cumin, chili powder, and cilantro. Stir to combine. 4. 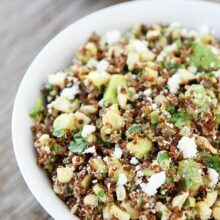 In a large bowl, add the cooked quinoa. Add the enchilada sauce, sour cream, diced green chiles, spinach and white beans. Gently stir until combined. Stir in 1 cup of the shredded cheese. 5.Pour the quinoa mixture into the prepared baking dish. Top with remaining shredded cheese. Cover the pan with foil. Bake for 20 minutes, then remove foil. Bake an additional 10-15 minutes, or until the cheese is melted and edges are bubbling. Remove from the oven, and let cool for 10 minutes. Garnish with avocado and cilantro, if desired. Serve warm. I assume you stir in the spinach mixture with the quinoa in step 4. Yes! I updated the recipe. Sorry about that! Well, I don’t need my food to be beautiful, just tasty. And honestly, I think the eye popping green on top makes it pretty nice looking. And since y our son Caleb liked, it, well that’s the only real test I need. Bingo. Making this. Looks gorgeous to me! Sometimes the most delicious foods aren’t the most beautiful! I always think soups just do not photograph well, but I LOVE soup!! this looks and sounds fabulous Maria! I love bakes. They are comforting, filling and delicious. Kudos on this one. Mmmmm….I know what I am making for dinner tonight! Love all the cheese! I’ve made a few not-so-pretty dishes, but still totally good, so I love that you blogged it. But honestly, this doesn’t look “ugly” to me at all. IN fact it’s looking super tasty. It LOOKS so tasty. You can almost taste the creaminess through the screen! I would eat this in a heartbeat! this look seriously good Maria! Totally making this for me & my kids!! Could I use kale instead of spinach? I have lots and lots of kale! Thank you. Curious, why do you need to bake it? Instead of combining in a bowl, can’t you just stir it around a pot until the cheese melts? What does the baking do? I can’t wait to make this ASAP!!! This looks so creamy and delicious! 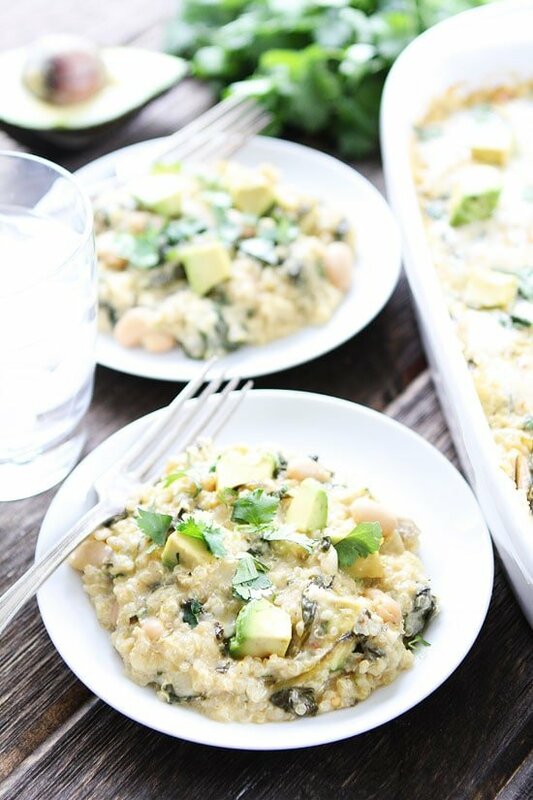 I absolutely love your spinach green chili enchiladas, this quinoa bake sounds perfect! Hopefully my 3 year old loves it like Caleb! It’s such a bummer when delicious food is utterly unphotogenic. This still looks pretty good, though! Anything with gooey cheese does! Oh, I love quinoa, but my repertoire has been limited to salads! Your casserole sounds amazing!!! I don’t mind the look, as long as it tastes as great as you say it does. I’m going to test this recipe out tomorrow night. We made this last night and loved it! Everyone had second helpings. Thanks for such a great recipe! It’s in the oven right now! I added a cup of white corn just because we love corn. I hope it is supposed to be a little gooey before going in the oven 🙂 We love your other quinoa recipes, so can’t wait to taste this one! I bet the corn was a great addition. I will try that next time! What a great bake – perfect for celebrating a little Cinco de Mayo next week! I made this today and it was very tasty! I used black quinoa and added halved cherry tomatoes to the topping before baking for more color. I also used roasted hatch chiles I had in the freezer instead of the can chiles. I will be making this often. Thank you! I am so glad you enjoyed the recipe! I will have to try tomatoes next time! Delicious. Husband and kid approved. I will definitely make this again. Thanks for posting this! This was delicious! We just made it for dinner. Just wondering if you freeze it before cooking or after and if you can cook it from frozen? I freeze it after baking and reheat it! Love this so much and have made it so many times. I am hoping you can provide me with a nutritional breakdown. Does not have to be super detailed, but I am on a pretty strict diet and would love to know calories per serving for this plate of deliciousness!!!! Just tried this and even my kids loved it. I added a small bit of shredded chicken on top for little extra protein. Super yummy recipe!